Welcome back to Pondering Playtime, my fortnightly series where I share a favourite picture book and a craft or play activity to go with it. 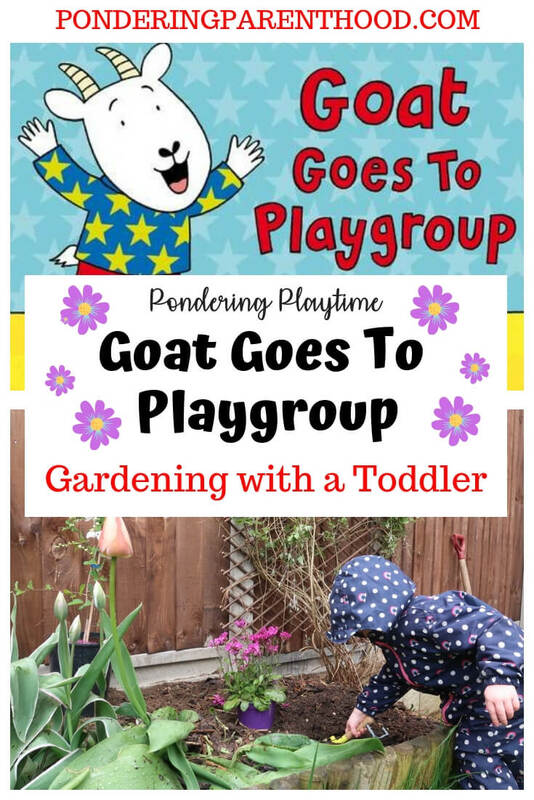 This week, I’ve chosen Goat Goes to Playgroup by Julia Donaldson, and we’ve taken inspiration from Mouse and Goat, and done some gardening. Goat Goes to Playgroup – What’s the Story? Goat Goes to Playgroup is about Goat, who doesn’t quite fit the mould at nursery. Nevertheless, he finds his own way amongst all of the other children doing their own thing too. This is a lovely book, if you’re looking to introduce your child to the idea of nursery, playgroup or preschool. We chose gardening for this week’s activity as our fence blew down a couple of weeks ago and we recently had it replaced. The whole process left our little flowerbed a little worse for wear! So we decided to buy some new plants to brighten it up a bit. 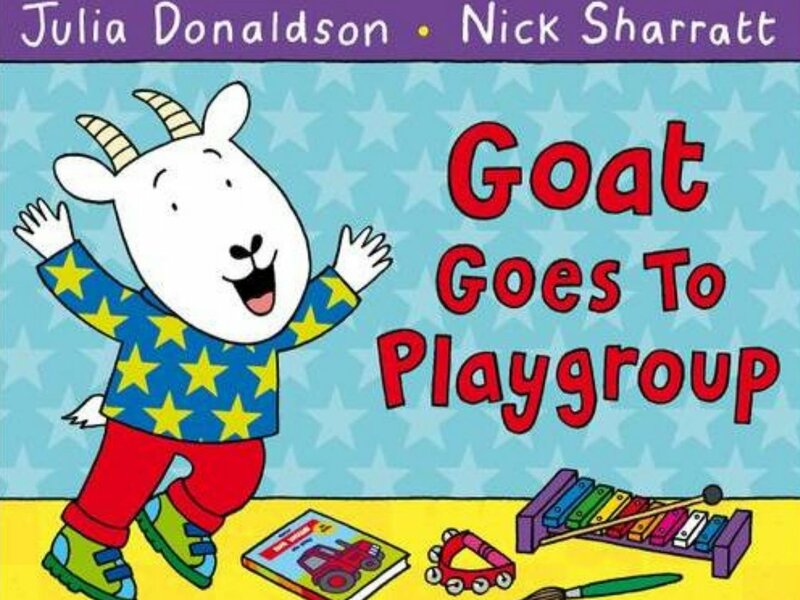 We’ve had a copy of Goat Goes to Playgroup for a while, but I decided to dig it out this week as M will be starting preschool in a few week’s time. She seems pretty happy and confident about the whole thing at the moment, but I don’t see any harm in taking the opportunity to chat about it and let her ask any questions or share any worries she might have. 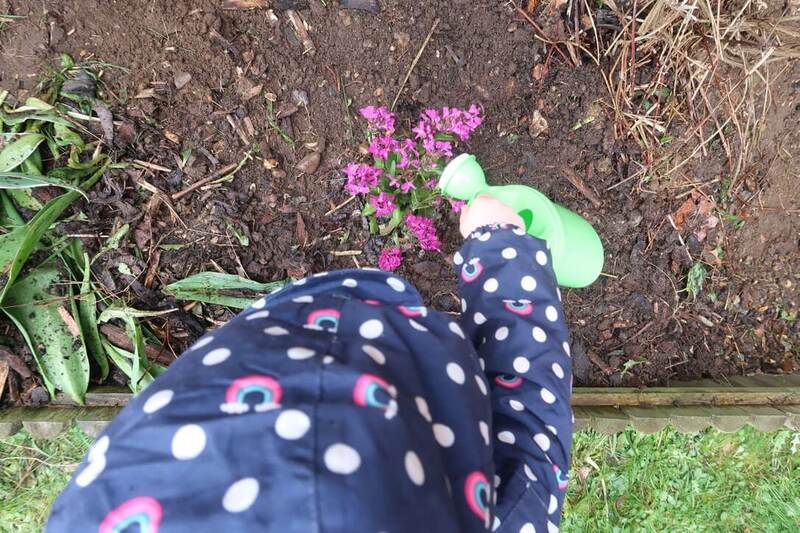 In the story, Goat does some weeding while Mouse sows some seeds, so I thought it might be nice for M to do some planting in our garden. We took a visit to a little independent plant nursery just down the road from us, and M picked out this purple flowering plant (no surprises there as purple is her favourite colour!). She delighted in carrying it over to the till, although she did manage to tip it out of its pot (whoops! ), which is why it looks a bit crumpled! 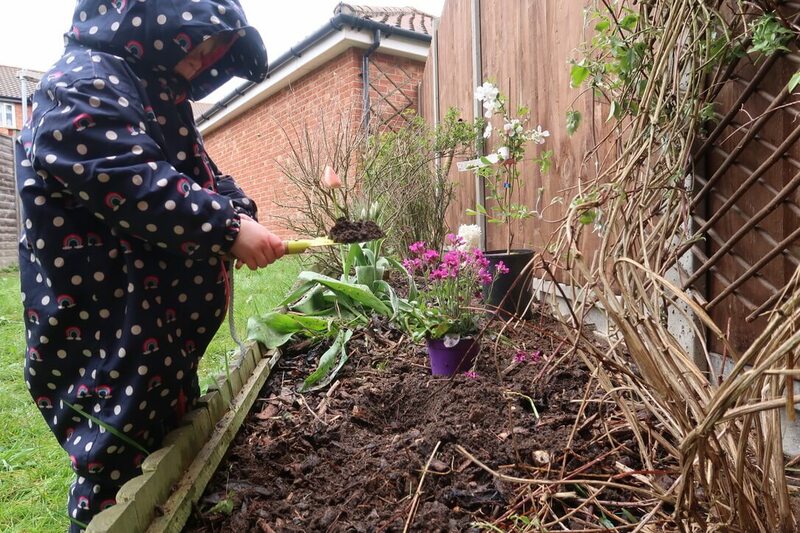 I showed M how to dig the hole with her trowel, put the plant into the soil and we talked about how important it was to give the plant a good drink. As you can see, it was a bit drizzly but we put on our wellies and waterproofs and didn’t allow it to stop us! 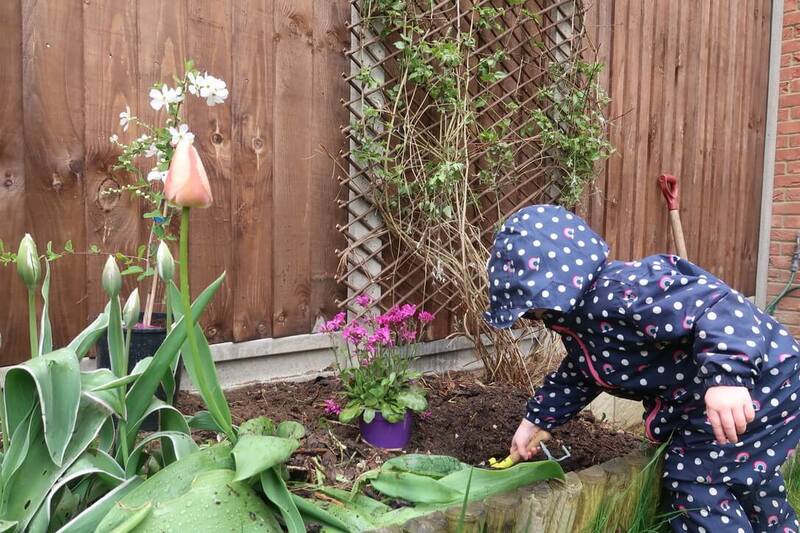 We’ve planted bulbs in the garden together before, but I think M particularly enjoyed having ownership over this task, being able to select her own plant and plant it in the garden. She lost interest in digging the hole quite quickly as she spotted a worm, which was far more interesting to her, so I finished the digging at her request. 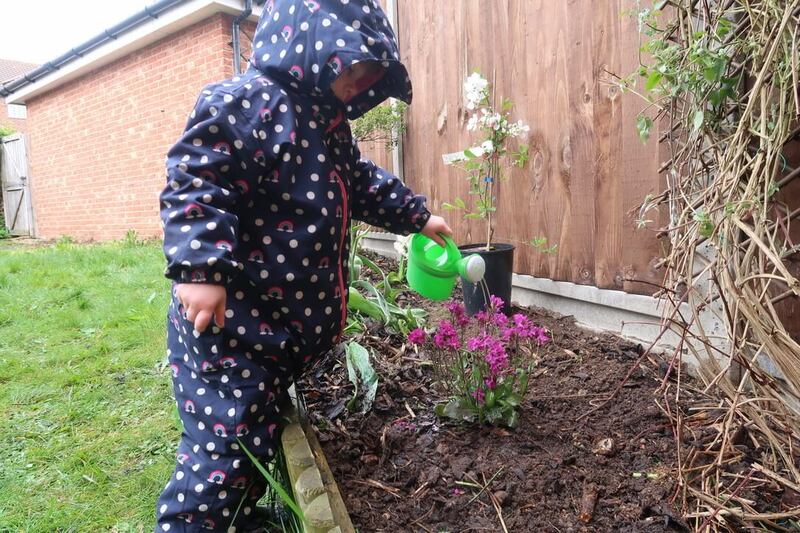 I think M’s favourite part of this activity was watering the plant. She’s still really into pouring, so this aspect of the task was right up her street! As for the story, M enjoyed reading Goat Goes to Playgroup again, and chatted happily about how she’s going to go to playgroup, Mummy’s going to leave her there to play and then come and pick her up again. Let’s hope she’s as happy and confident when the time comes to actually do it! "Life After the Pavlik Harness: The One Year Check"